Registration is now open for the 2019 14U and 16U Cups. Check out the About Page for everything you need to know about next year's tournaments. The 2019 USA Baseball Road Map has arrived. Learn how you can start your journey to be a part of Team USA and play for glory. Game on Roundtrip came out firing on all cylinders in Sunday's 2018 USA Baseball 14U Cup gold medal game, defeating the North Carolina Baseball Academy Red Sox 10-0. 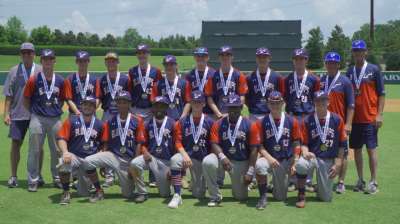 The Blue Chips captured gold at the 2018 USA Baseball 16U Cup on Sunday after defeating Carolina Rebels by a score of 8-3 at the USA Baseball National Training Complex in Cary, North Carolina. Are you ready for the season? Catch all the latest gear including this New Era Navy/Graphite BP Prolight 59FIFTY by visiting the USA Baseball Shop online!